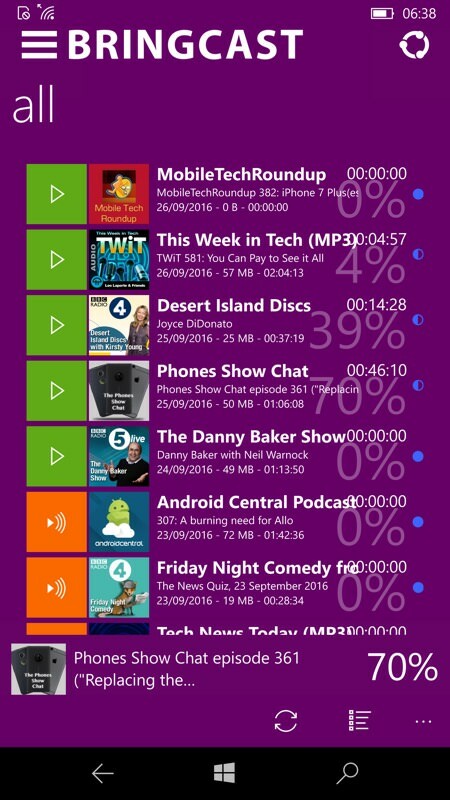 It has been a while since we mentioned BringCast on AAWP, but I've been keeping a very close eye on the podcatchers scene in terms of developers bringing forward old Windows 8.1 applications into 2016 and in full UWP app guise, ready for optimised use on Windows 10 Mobile, Continuum and beyond. And, with last night's beta, I think the time has come to recommend BringCast, joining Grover Pro in the top tier. 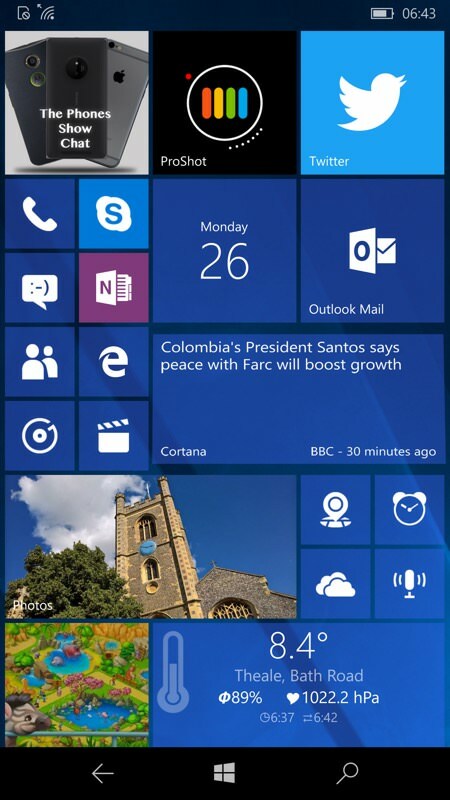 You might well ask why I'm concentrating, in this mini series of reviews, on UWP apps - after all, don't the old Windows Phone 8.1 applications still work? Well yes, they do, but they're starting to creak at the seams a little and it's clear that both the exteriors (Windows 10 design language and conventions) and interiors (background agents) need attention if an application can be fully recommended as a title that works on any size screen, even the desktop and via Continuum. 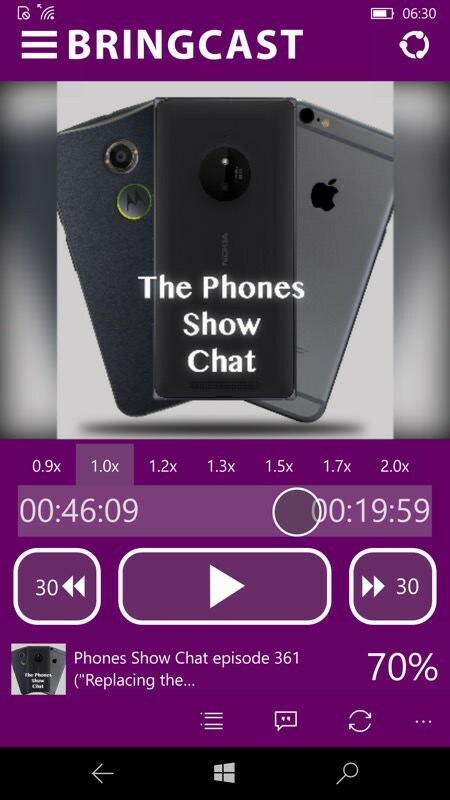 Of the 20 or so Windows Phone 8.1 podcatchers, only a handful are being actively developed still and being brought into the Windows 10 world in a meaningful way. BringCast is the second I've looked at in detail and I should warn you that this is still labelled, in the Store, as a 'Public Beta'. What does this mean, given that I'm recommending it here? Well, the core playback, download and management engines are all present and correct, but there are a few non-showstopping UI issues that are still being worked on. In other words, I've been able to use it and rely on it day to day, but I'm also grateful for the weekly beta updates and the occasional app restart seems to help too. The colour scheme screenshotted below was actually my idea (to the developer) back in the day, though there are a variety of other themes that you can apply instantly to BringCast. So don't be put off by all the purple! 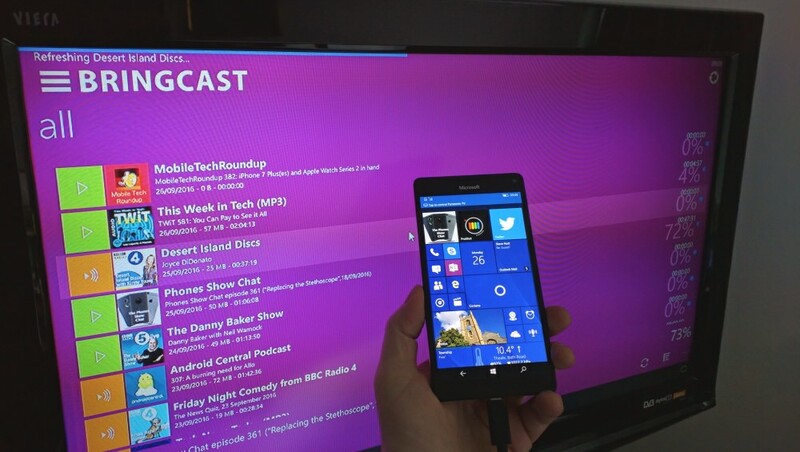 I have no idea how much BringCast costs anymore - the original had various other functionality and settings avaiable as in-app-purchases, but all this is still being overhauled for this, the UWP app, and not all the balls have settled back into place. This is a free download but expect a small in-app-purchase of some kind at some point. In terms of presentation options, there's (if anything) possibly too much flexibility here. 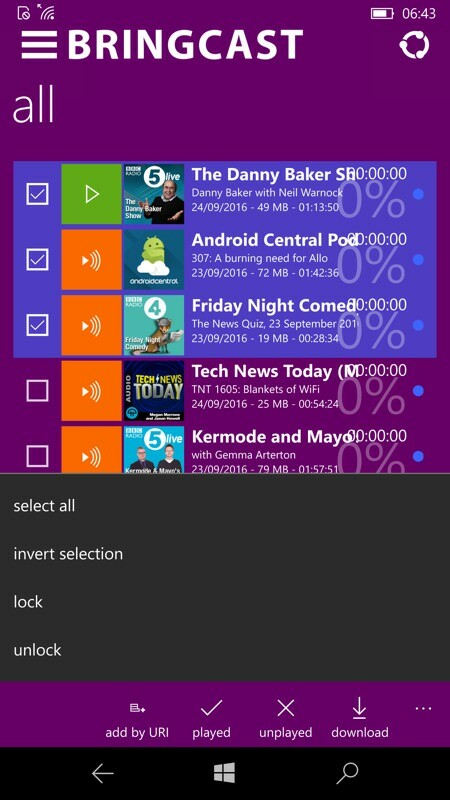 I settled into using the 'All' filter, effectively 'all podcast episodes sorted in reverse date order', i.e. latest at the top, but there are many other filters available, plus playlists, which auto-populate if you set specific podcast subscriptions up to feed into these. It's all comprehensive - and a tiny bit overwhelming at first. I did love the layout though, as shown above right, with a clear indication of which podcasts had already been grabbed (in the background) for offline listening, how far you'd got through each, and so forth. The UI throughout BringCast is unashamedly big and bold where needed - and fine and detailed where needed. The 'Now Playing' pane, with its controls, is a prime example of the former, with big, finger-friendly controls and direct access to speed adjustment options up to 2x, while you can nudge the playback position around or just drag the large circular control. You can get to the Now Playing screen in several ways, not least by tapping the cover art in the bottom playback bar from any other screen in BringCast - curiously, you can't tap anywhere else in the bar - yet, I've fed this back to the developers. When adding a podcast (you won't do this very often because the import facilities in BringCast are excellent), there are various parameters which you'll want to look at, not least setting each to 'download' (rather than stream) if you're like me and would rather have everything grabbed while you sleep (etc.) over Wifi and then you're sorted for when out and about. Unfortunately, there's no way to set this as a default for all new podcasts or to 'apply to all', so you have to head into each podcast for a one-time selection. 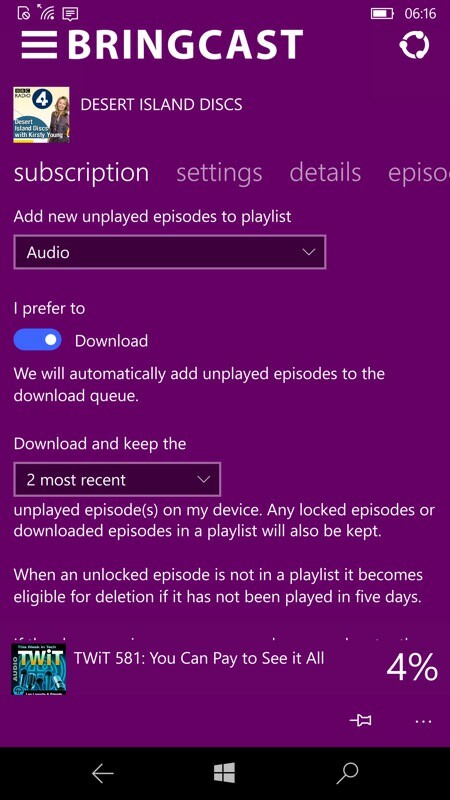 You do get selection boxes across subscriptions to mark combinations played or to manually download latest episodes, though, as shown above, left. Above right, the various filters available and one will probably suit you, even though my favourite 'All (by date)' isn't listed, this is only - in the current version - available from the hamburger navigation menu. Again, something fed back to the developer as part of the public beta programme. 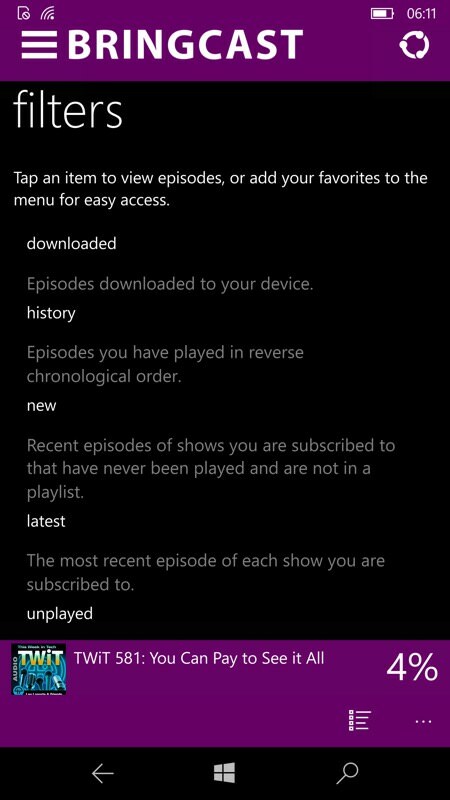 Here's the 'downloaded' filter in my current set-up - this may also often be just what you want, though its contents and that of 'All (by date)' should be pretty similar once everything's set up and all subscriptions have received a new episode. BringCast uses its own podcast directory, rather than piggy backing on iTunes, as a lot of other apps do. This does mean that it's well curated, though it also means that new podcasts will take longer to arrive, since they have to be submitted manually. In this public beta, the categories are a little bit 'flaky' in terms of display, plus not having any category art looks 'wrong' somehow - as if something didn't download! 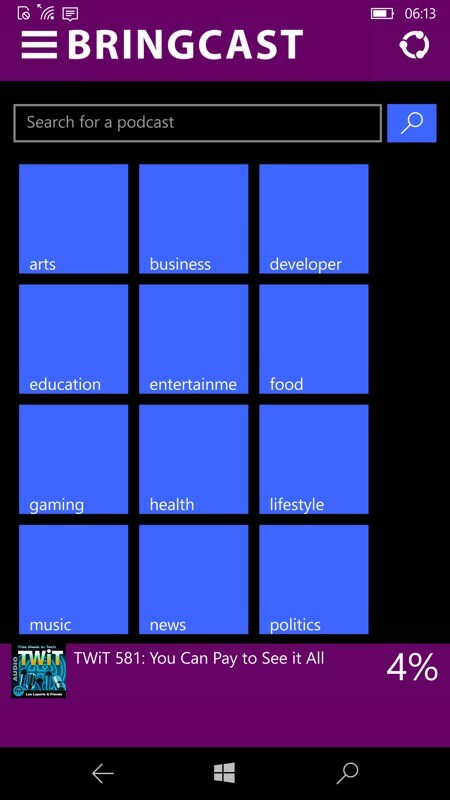 Within the 'explore' directory, while it's working, you can sort within each category by various criteria and it's trivial to tap through, like what you see and then 'subscribe'. 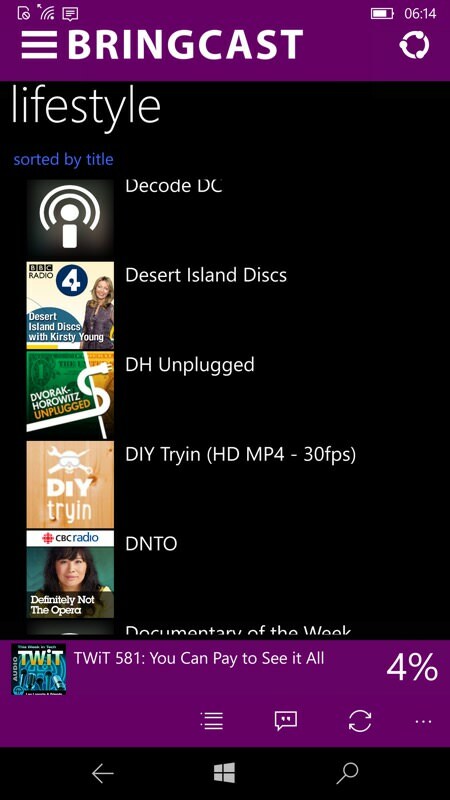 Shown above, right, BringCast's live tile (top left) is one of the highlights, always showing you the podcast you're in the middle of, as a reminder to pop back and carry on with it. Being a full Universal Windows Platform application, there's compiance with everything you'd expect. You can swipe away the controls to gain more screen real estate, run this application as-is on a laptop (i.e. 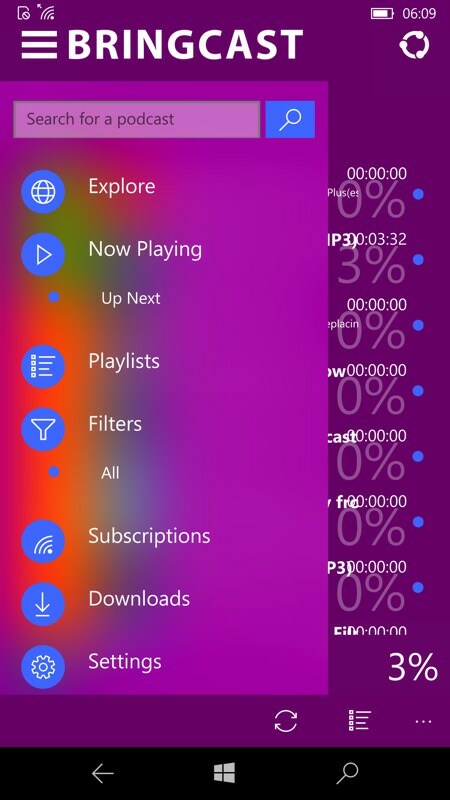 from the Windows Store there) or simply plug your smartphone into a secondary Continuum display, as shown below - the interface isn't in any way optimised for such large screen use, at least not yet - maybe this will get better in time once the phone-specific UI is fully polished. 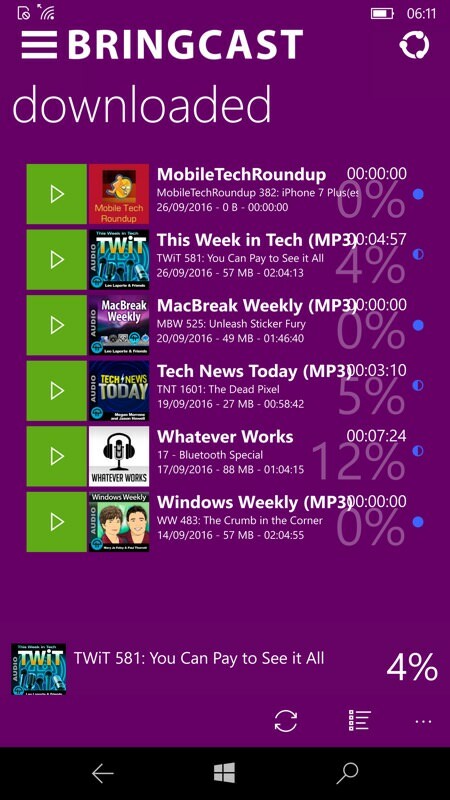 I've been 'training' BringCast UWP for a week now under the Anniversary Update Release Preview, in terms of waiting for podcasts to arrive and be grabbed. This review was prompted by the latest beta release, last night, and there's definitely enough here to let me recommend that others try it too. You can grab this here in the Store.